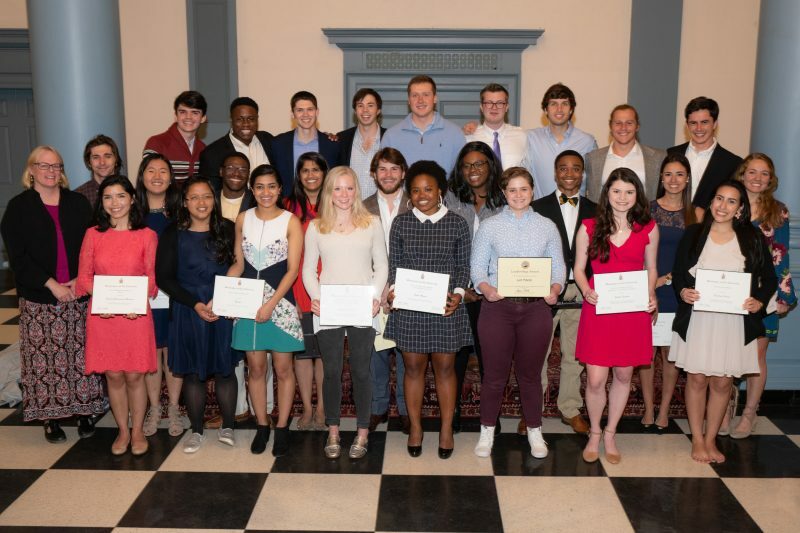 2019 LEAD Banquet Recognizes Leadership Across Campus The event celebrated many individual and student accomplishments. Washington and Lee University’s student leaders were recognized at the Office of Student Affairs’ annual Leadership Education and Development (LEAD) Banquet, which was held Sunday, March 31. “Each year, the LEAD Banquet brings our community together to celebrate the meaningful work of our student leaders across campus,” said Megan Hobbs, associate dean of students and dean of sophomores. This year’s Banquet Committee was led by Julia Moody ’20 and included committee members Allan Blenman ’19, Jenny Graham ’20, Annie Lentz ’20, Lexi Prochniak ’20 and Khang Truong ’20. Recognizing a student who demonstrates a commitment to their community through innovate service. Recognizing the campus group or specific event that proved to be impactful by engaging and educating a significant number of volunteers and created a meaningful difference for the population served – whether locally or in another community. Outstanding Philanthropic Effort: Alpha Kappa Alpha Sorority, Inc.
Recognizing the student organization/chapter whose philanthropic efforts have made the most impact on our campus while supporting a local/national/global cause. The most funds raised per capita and the most innovative way of raising those funds is a factor in selection. Honoring students who show outstanding leadership to improve the lives of the LGBTQ communities on campus and in the surrounding local area. Recognizing a student’s summer work experience/research that best exemplifies Washington and Lee’s values of service, leadership and character. Recognizing the most noteworthy, creative and inspiring publication created by a student. Recognizing a student who is passionate about leadership education and its practice. This student should bring innovative ideas to the table and exude a high level of commitment to empowering other student leaders. Recognizing a student whose leadership has been most impactful during the past academic year. Recognizing a Greek man making the greatest and most positive impact on the fraternity and sorority system during the past academic year. Recognizing a Greek woman making the greatest and most positive impact on the fraternity and sorority system during the past academic year. Honoring a rising senior (current junior) who manifests superior qualities of helpfulness and friendliness to fellow students, public spirit, scholarship and personal character. Recognizing a rising junior (current sophomore) who has shown involvement and leadership within the W&L academic and extracurricular communities and who has furthered discussions of women’s issues on campus and beyond. Awarded by the Student Affairs Committee to an undergraduate student who demonstrates extraordinary commitment to personal scholarship and to the nurturing of intellectual life at Washington and Lee. Recognizing students who exemplify Public Safety Senior Sergeant Larry Stuart’s character and commitment to the community. Recognizing the event that best impacted Washington and Lee during the current academic year. Recognizing students who lead sustainability efforts either for the W&L campus or for our global community. 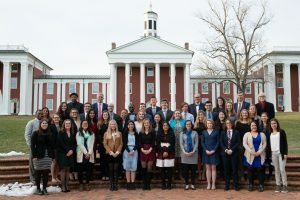 Recognizing the student organization or student-led event that has made an impact toward sustainability-related efforts either on the W&L campus or in our global community. Recognizing the student organization that has shown excellence in leadership, management and programmatic efforts. Allocation of funds is a factor in selection. Recognizing a campus adviser who goes above and beyond in their efforts to support student initiatives, foster relationships and provide opportunities for new experiences. Recognizing a student who has made the greatest contribution to the Division of Student Affairs. Recognizing a student who has brought the most depth and breadth to the university during the past academic year. Honoring seniors for their campus leadership. Recognizing two outstanding student leaders who demonstrate leadership and commitment to the Washington and Lee community as determined by the Vice President for Student Affairs and Dean of Students. 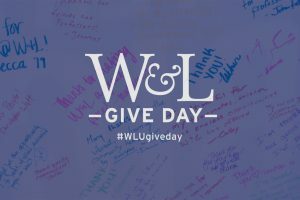 Give Day 2019: Thank You!